Yoga is more than just poses. The Asana (physical practice of yoga) comprises just a small part of the yoga journey and the overall Eight Limb Path as spelled out in Patanjali’s Yoga Sutras. Find inspiration and wisdom by enjoying one of my favorite yogic quotes. 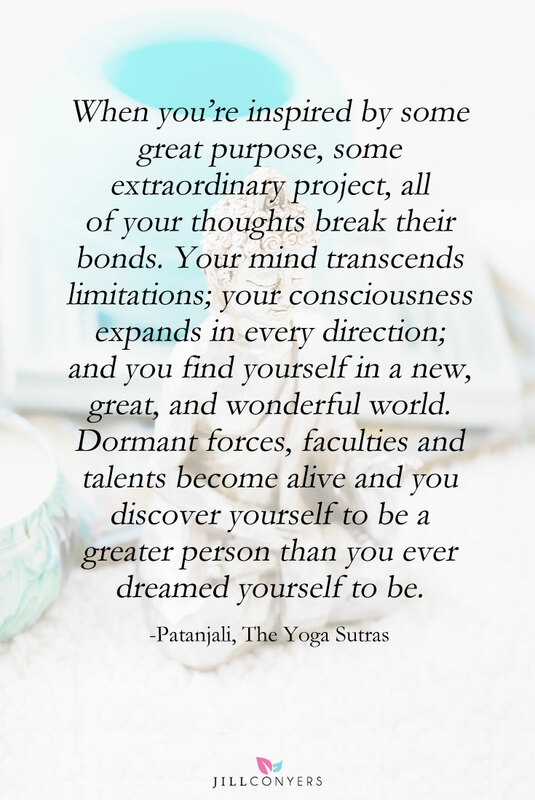 This quote describes perfectly how I feel about becoming a yoga teacher. I’m a different yogi than I was in January. This journey has shown me that when my heart and mind are open the possibilities are endless and quite extraordinary. I’m sitting in the beautiful mountains of Georgia at a yoga retreat waiting to go on a sunrise walking meditation. How perfect does that sound? To celebrate the completion of YTT200, I’m excited to announce the kick off of Yoga Week at Jill Conyers | Fitness, Health & Happiness. I have amazing guests lined up for next week and information to inspire you to start or grow your yoga practice. Please join me next week in welcoming Wendy, yogi runner, from Taking the Long Way Home, Jess, personal trainer and RYT, from Hello To Fit and Beth, RYT, from Sublimely Fit as they share their knowledge and personal experiences with yoga. Do you practice yoga regularly? If not, are you interested in starting a personal practice? I’ve always been interested in Yoga but I have never got into it! This sounds like so much- I might have to check it out! Thanks for sharing! I love yoga. I try to do yoga twice a week but I definitely meditate every morning. Sometimes I am so tired but yoga always make me feel better! I really do want to step up my yoga practice, I enjoy the physical challenge and the way it relaxes me! Looking forward to your yoga week! No, I don’t practice yoga regularly. I try to do it once a week but sometimes I just need 2 complete rest days. Yoga will always be transformational, even when it stops being cool. Glad to know you are inspired by world best yoga institute. Patanjalis. Love this and I love yoga, so will be sure to read back for all the guest posts 🙂 very good idea! Omg a retreat sounds like a total dream!!!!! Cannot wait to see all the guest post!!!! I don’t practice yoga regularly but I know someone who swears by it. Not only is she in great shape but she states it keeps her healthy too. I used to do Yoga more than I do now. I miss it, I need to make time for it in my life again. I do love doing yoga from time to time. It hurts my back if I do it for a longer period of time, like when I took in college. But sometimes, I need it. I know a lot of people that love yoga. I haven’t really tried it myself but I definitely hope to soon. Yoga is one of my favorite exercises because it keeps your mind at peace as well. It’s the perfect exercise if you want to relax and relieve stress and I think it’s great that more and more people are recognizing it. I’m looking forward to your guests for the week! That is awesome I cant wait to see the upcoming guest posts. I am yet to try yoga that doesn’t involve an app but there is always time to try it out. That retreat sounds great. What a inspiring thing to do. I wish I could add in some yoga to my routine. Love this! So inspirational. Can’t wait for the guests posts! I’ve been practicing yoga regularly for several years now. Lately I’ve been going less frequently but I’m hoping that will change soon! I used to practice yoga more regularly before I had kids. But now I am making an effort to begin my mornings with a short yoga routine. It helps me stretch out for the day and set a tone of balance. Writing my post was so fun…I loved recapping my yoga journey and seeing how far I’ve come since I started. I am beyond excited for you! Congrats! I can’t wait to follow a long next week for the series. Yoga tends to give my life balance and I am always anxious to improve it! It is wonderful to love what you do. Yoga is amazing for body and soul. How exciting!! My yoga practice shrinks when I’m training for a half marathon, but I still practice, especially after running, to stretch out. I used to be a loyal yogi but since I moved out of the city there are no yoga studios and I never practice at home. I need to get in the habit again – I’m excited to see more from your guests. that is EXACTLY why i want to go through YTT. the time will come, college is now *sigh*. i can’t wait for the week ahead! thank you jill for organizing it, and to Jess, Wendy & Beth for contributing!! This sounds wonderful! I’ve never tried yoga before. I think I should, though. I do enjoy yoga. The stretching and quiet motions are amazing. As a Christian though I don’t necessarily agree with all the mantra’s and such but have found some really wonderful yoga programs I do feel comfortable using. Have a wonderful time at the retreat. Congrats on finishing your yoga teacher training – what an accomplishment! That sure does sound pretty perfect and peaceful to me. I used to completely tune out the spiritual side of yoga but I am slowly letting it in. The retreat sounds divine. Enjoy! I’ve been doing yoga since I was 19 and I love it. It all sounds wonderful, a yoga retreat and guest posts! Lots to look forward to, Thank you for hosting! Can’t wait to read the guest posts this coming week. years ago, the thought of doing yoga was of no interest to me. But now I look forward to participating every week in class and love seeing the results that it brings both physical and mental. Love this. Can’t wait to read all the guest posts next week.